If you have diabetes or know someone who does-it is really important that you manage the condition well. 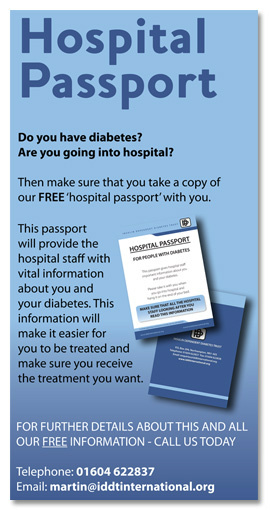 The InDependent Diabetes Trust has a plethora of reallly useful information, including resources such as a Hospital Passport. More and more people in the UK are being diagnosed with type 2 diabetes and it is important to be aware of the condition. Usually, the condition comes to light as a result of secondary problems that arise as a result of unknowingly having high blood sugar for a long period of time. Poor control of blood sugar levels can cause problems with your organs such as your eyes and heart. It can also cause kidney damage as well as nerve problems which can lead to further complications including amputations. Please have a look at the IDDT's brilliant website, download their passport and get in touch with them in order to improve your quality of life and your future prospects. Please have a look at the NEWS section as I have included further information there. IDDT is a charity that actively listens to its members and is all too well aware of the difficulties that children with diabetes and their parents and families face in everyday life when managing the condition. One area that proves particularly problematic is managing the condition at school. With this in mind, IDDT has produced a new, free booklet, a Parents Passport for Schools. The passport has been designed to provide a means by which parents can formally let schools know how to manage their child’s diabetes and in turn support schools to comply with SEN regulations, as well as informing teachers about the condition IDDT has produced similar documents for use in hospitals and also in care settings, such as residential care which have been very well received and proved very popular. As with all our leaflets, the passport is FREE.